PUBG Mobile and Fortnite Battle Royale are two similar kind of action games that have taken the mobile gaming industry by storm. Both the games have their own quirks that make them fun for players to play for long hours. PUBG Mobile is a game in which 100 players parachute to a battlefield of their choice and with the help of their gathering skills and survival instincts have to fend off other players to win. The last man standing is declared the winner. 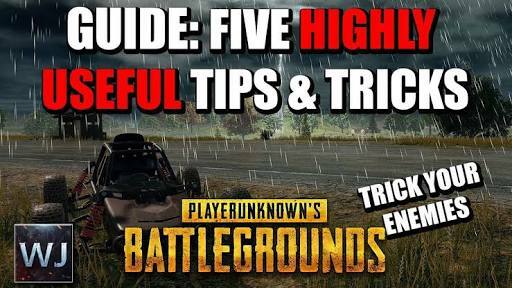 Here we will be discussing five tips that will help you succeed in the game, and in the end might even get you multiple chicken dinners. Running barefootShoes can make or break an outfit. Most of us know that and presenting yourself as the best dressed can go a long way. However, wearing the best shoes just to show off isn’t always the brightest of ideas. In games like PUBG, Counterstrike Go and Call of Duty, players listen carefully for footsteps to know which direction an enemy might be coming from. Unlike Counterstrike Go and Call of Duty, PUBG allows players to minimise the amount of sound they make even while running. This can be done simply by removing the characters shoes in the pre-game. This might not sound like much, but when you put this trick to use, you may experience a noticeable drop in the number of players able to take you by surprise. Playing mind games is the oldest trick in the book for gamers. But for a game as popular as PUBG, which is seeing a huge amount of player inflow, you may just be lucky enough to never be paired with the pros. PUBG players have a tendency to run towards the action and gain the most amount of kills, even if it means getting killed and and not winning. So you can take an advantage of this by turning on your microphone for the whole battlefield instead only for your team, after you get a good vantage point with a good gun, you will be able to get kills by the numbers. After your microphone is open for all, you can start shouting your location (not the vantage point of course, but where you have your crosshair pointed at) and that it has a lot of players fighting and you need backup.Keep uttering false information about your location, and if some of your opponents have their mic turned on for all, might take your bluff seriously and want to verify its authenticity. If that happens, you can score a lot more kills. Players will definitely cry foul if you use this tactic, but in the end, they will not be the ones winning the game. Sitting in the back seat of a closed top vehicle. We all have watched a movie in which a cop stakes out in a parked car for a criminal to make a mistake. In PUBG Mobile, when you are sitting in the driver’s seat of a car, there is a driver’s symbol above your car to tell other players that it is being driven by someone. You can simply find a good vantage point, where you can stake out other players, like the highway outside Pochinki. Once you have parked your car, go take up the back seat so that players think the car is empty and run towards it to use it. However, when they are close enough you are there to jump them. For this trick to work, you have to keep in mind that it must be a closed top car or you will be spotted sitting alone in the back seat by players miles away. Everyone likes the idea of keeping their look sleek, however, that isn’t always the best idea in PUBG. According to the map you select and the area that you select to land in, you should choose the best colour coordinated outfit that helps you blend into the background. So even when you are freely roaming around in the open, you will be very hard to spot. This will lead to other players getting to know your location a bit too late when you have a perfect aim and start firing at them. Even if one or two players spot you roaming around and start shooting, you just need to start running in a zigzag pattern. That will make you avoid the bullets and after some time again get lost in the background.Some good examples would be a pioneer shirt, padded camo jacket, grey/green combat pants, leather gloves, and hi-top trainers for the Erangel map, and for the Miramar map, players can opt for a bloody tank top, khaki combat pants, tan gloves, brown hi-top trainers, or just roam around naked (seriously). An exception that will work in all PUBG maps as camouflage is the Ghillie suit, which is only available in the crate drops. This is one habit that parents have been trying to teach their kids for ages, and those who have learnt this are already a step ahead of most other players in PUBG. When a new game starts, all the building have closed doors, to indicate they have never been raided by a player. Players start raiding buildings left and right from the moment they land on to the battlefield, and leave all doors open after or during a raid. A good trick is to close doors behind you once you enter so you can sit quietly in a building waiting for players to come and raid it, without a clue that it is already occupied. And when they do come, surprise them. Go back and close the door again. Repeat.